Guess who’s back with goodies? Ok, maybe no actual goodies. 1. Fortnite and PUBG Go! Well, they go mobile anyway. Both Fortnite and PUBG have made their mobile debut on bothered the Android and iOS app stores. Scaled down to fit and run on mobile devices without losing any of the features that players love is an incredible achievement. More so for games of these massive scales. Even more amazing and most users are reporting that the mobile version of PUBG runs smoother than the Xbox One version. I feel like that’s good and bad news. Either way a congratulations is in order for both development teams. This moment will be a big one in the history books years from now. 2. The Dino’s Are Coming to Switch. Nintendo’s best console continues to secure incredible content to bolster its already impressive portfolio. At the 2018 Game Developers Conference Studio Wildcard announced that Ark: Survival Evolved will be coming to the Nintendo Switch. The Switch version of the game is being co-developed by Abstraction Games but fear not, it will feature all the content from the original release. Alongside the announcement, Studio Wildcard also announced that beta invites for the iOS version of the game have been sent out. With the Nintendo Switch also recently getting an announcement of other top games coming to the console like Diablo 3 and the new No More Heroes entry, things are really looking good for the unique machine. 3. Here comes a new cameo! One of the many things this console generation will be remembered for is definitely going to be cross branding. It feels like everyday there is an announcement of some sort of cross branding going on with our favorite games. Don’t believe me? Watch this. First we have the announcement that Geralt from the Witcher series will be joining the cast of the upcoming Soul Calibur 6. It’s undeniable that he’s a perfect fit but remember that’s just example 1. Here’s example 2. Noctis, the protagonist from Final Fantasy 15, will be joining Tekken 7 as a playable character in an upcoming DLC pack. Noctis is an interesting addition to a game that already has a visit from a resident character in Street Fighter. But wait I’ve got one more for you. Monster Hunter World will be getting some Devil May Cry themed DLC. With rumors striking of a new entry in the series and the remastered version of 1-3 releasing soon this screams cross branding even if it is the same parent company. There you have it folks, the generation of the cameo. 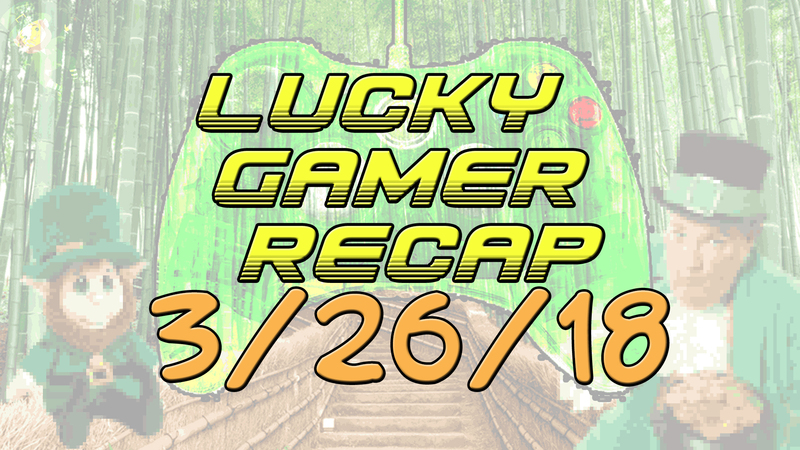 Every week the Lucky Gamer Recap has some leak based information. Little slip ups by retailers or job resume updates, you know the usual. This week however I wanted to give special attention to Leaks because some of them have my pants tightening. First up we have the one most exciting for me, an Amazon listing for a 2018 Splinter Cell game. Please be real. The Sega Genesis Collection is coming to PS4, Xbox One, and PC if a deleted tweet is to be believed. I’ll throw this rumor in with the leaks because why not. Supposedly Cyberpunk 2077 will be at E3 in some capacity. That’s the other rumor that has be losing my pants. And if a recent job listing is real then boy do the Star Wars fans have something good coming. Apparently EA Vancouver is hiring for an open-world Star Wars game. Hows that for exciting potentially fake information? 5. Official Releases in exchange. First let’s start with an annual franchise. Call of Duty: Black Op 4 is coming to a console near you on Friday October 12th. That’s all I’m saying on that one. Shadow of the Tomb Raider, the third entry since the reboot, will be arriving to PC, Xbox One, and PS4 on September 14th. Looks like the timed exclusive stuff is coming to an end, thankfully. The Crew 2, the follow up to Ubisoft’s open world racing project, will be releasing on June 29th on Xbox One, PS4, and PC. For those of you still willing to purchase Konami games, Bomberman R will be released on PS4, Xbox One, and PC with platform exclusive characters on June 12th. Anyone who read my review of Yakuza Kiwami and found themselves interested in the series, rejoice! Yakuza Kiwami 2 will be released on August 28th exclusively on PS4. And previously PS4 exclusive Hellblade: Senua’s Sacrifice will be coming to Xbox One on April 11th. Now hopefully that makes up for any of the rumors or leaks that end up being complete lies. 6. Oh my and the announcements! With E3 around the corner this is the time that smaller studies used to announce their upcoming games and big studios announce the projects fans are expecting so they can save the surprises for late. It’s better this way. Nothing cool gets over shadowed by the big name stuff flying around all over the place. Ubisoft has a big surprise up it’s sleeve if it’s choosing to announce the slightly unexpected Tom Clancy’s The Division 2. Maybe because it’s the Omega Force 20th Anniversary or maybe its because Dynasty Warriors 9 was so bad, who knows? Regardless Koei Tecmo announced that Warriors Orochi 4 will be coming to America sometime in 2018. Narcos, the Netflix phenomena that took the world by storm sort of, is getting a video game adaptation in development by Kuju. Who is Kuju you may ask? Well I don’t know, I’m no journalist. Kidding, kidding.